Every night, I take a long walk through my storybook'esque German village. I love these evening walks, partly because of the scenery, but also because I always have an audiobook to keep me company. I'm so at peace, absorbing the story and beauty of my new home all at once. It's no secret that I love listening to audiobooks. They're great for walks, car rides and for making folding laundry a little less mundane. A couple months ago I shared on social media that I was going to be starting a membership with Audible. A few of you had mentioned that you were curious about the service and wanted my feedback...so here it is. Before Audible, I found my audiobooks at the library. This was handy...IF they had the audiobook I wanted. Even then, I had the cumbersome task of changing CD's or taking an entire afternoon to import them to my iPod. And God forbid I lost my spot or had to move the CD from the car to the house. Oh and who wants a million messy audiobook albums hogging up their iTunes library? Then, I found Audible. I'll admit, I was hesitant. You guys know I'm not a fan of pay for something I could get for free. But here's the way I look at it...I'm paying for the convenience and the selection, and to me...it is so worth it. Think of it like Netflix. You pay a monthly fee for a certain number of audiobook per month. It's not a rental. The audiobooks are yours to keep. Once you get a membership, you get credits for however many audiobooks you signed up for per month. You log in and it says "Hi Jessica, you have 1 credit." It's all very exciting because then you can go shopping! (By the way, each book I've seen is 1 credit each) Every month, you get an email...you have another credit! (yippee!) I love this credit system because....say you're not done with last month's book and you don't know what you want for this month. Well, no rush. That credit will be in your account waiting for you. I love that. And what if you blow through that one audiobook before your next credit rolls in? No worries. Another benefit of membership is that you can buy extra audiobooks at a super low rate! They always have members-only sales going on too. It makes me feel special. Once you have credits on your account, you have the daunting task of choosing a book. Seriously, they have everything. Right at your fingertips. Shopping the site is a breeze. They've organized it well and give recommendations based on what you've already viewed. Can't decide? Read a review of the book AND the reader. I love this because as I've said before...the reader makes the audiobook. You can even listen to a snippet of the reading to hear it for yourself. Seriously, are you in love yet? Once you've chosen your first audiobook, you may be like me and feel a little intimidated with the process of downloading the selection. This was where I was weary. I didn't want a giant file to deal with. But I also didn't want to separately download each CD. I was scared I would download it wrong and lose my purchase (I'm irrational like that). This is where they really exceeded my expectations. Once you purchase your audiobook, it waits for you in your Audible library, where it stays to be yours forever. They offer each audiobook in the format of your choice. If crystal clear quality is your main concern and file size is not...you can choose the best format. If you're low on space, you can choose a less clear (but still functional) format. Then, instead of downloading the whole shebang at once, they break it up in two parts. Then, once you download it, it slides right into place in your iTunes library into the audiobook library in one nice clean and pretty album. No messy albums. No formatting tricks or confusion about what CD is which. It's there and ready for enjoyment. Go forth and listen. There is so much to explore on this site. They have literally thought of everything. You can download an Audible app and listen on your smartphone. You can buy a Kindle e-book version of what you're reading and it will sync up automatically. You can even listen to it on your Kindle and since it's an Amazon company, it's already linked up with your Kindle account. Everything is seamless. Honestly you guys, this is legit, and I really feel like Amazon is giving book-lovers like us a reliable service. No strings. No gimmicks. I hope you try it. I hope this was the push you needed to give audiobooks a chance this summer. And if that wasn't enough, Audible is offering you, my lovely readers, a free trial. Have at it, my friends. 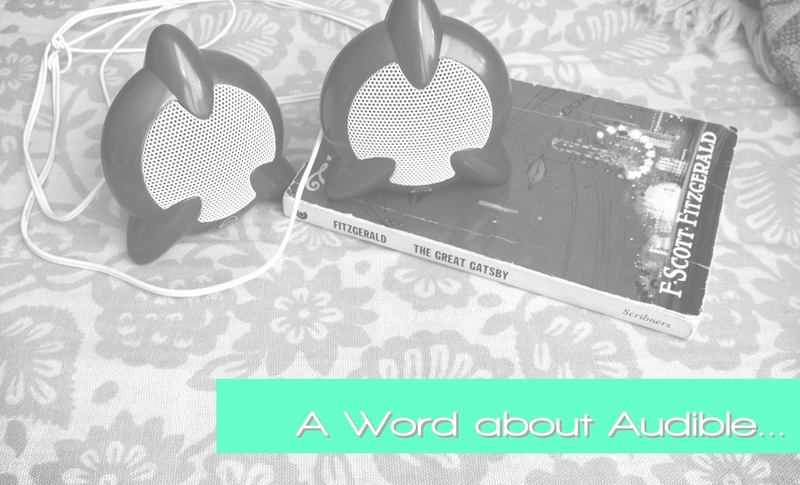 This post was sponsored by Audible in return for an honest review. All opinions seen here are completely my own. Thanks for sharing all this information! I have yet to get into audiobooks. I find my mind wanders whenever I try to listen to one, and before I know it ten minutes has gone by and I have no idea what just happened in the story. I've heard that they take some time to get used to. Knowing how many more books I'd be able to experience if I had audiobooks on the go as well is enough to tempt me to try them out again. Oooh I might do a free trial. We're going on a road trip soon, and I kind of like the idea of listening to a book! I was never into audiobooks before (my mind wanders) but I'm temped to try! I’ve just gotten into the audiobook game, and I mainly listen to them on my commute to work so I actually don’t mind using CD’s. I looked into Audible, but the prices scared me away, ha. If I had mp3 capabilities in my car, I would probably look into it more but I tend not to like to pay for something I can get for free from my library ;). Great review, though! I love Audible! I use the iPhone app and it is a life saver. I can listen to my books on my walks, working out, cleaning. It's great!